Sunshine is receiving her first communion later this month. She’s spent the last two years in Catechism classes at our local parish, preparing for this day. As a convert, I also remember my own years of preparation before receiving. It’s been neat to watch her journey toward this. Over the last two years, I’ve noticed that she’s definitely grown in her faith, becoming more attentive at Mass and more interested in prayer and confession. 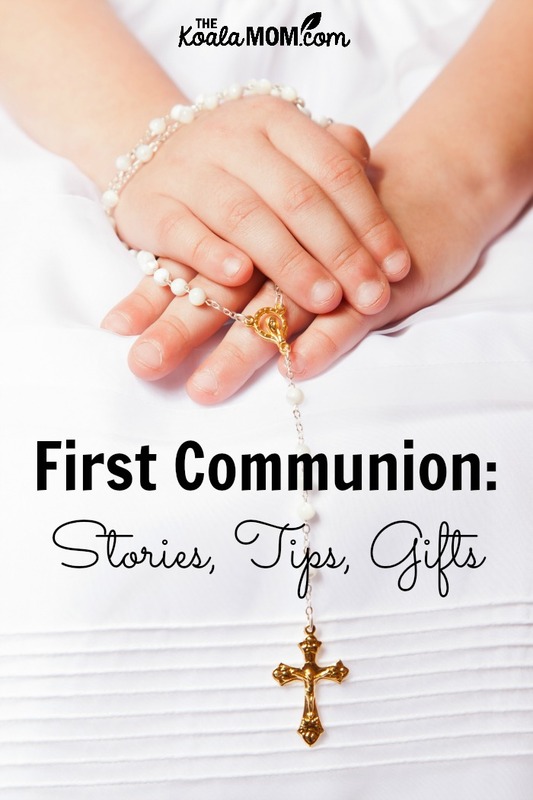 If you also have a child celebrating First Communion this year, here are some tips and stories from other Catholic moms. I’ve also compiled a list of gift ideas for your little communicant. Preparing Your Child’s Soul—seven great tips for helping your child get ready for their First Communion. Preparing Your Child At Home—one mom shares what she does to prepare her children at home for their First Communion (includes links to resources and a semester outline). When Religious Education Programs Thrive, We All Win—why a great parish catechism program is so important for our children’s faith. Henry’s Second Communion—Rabia shares her son’s joy about receiving the Eucharist for the second time. Letting Your Child Go With God—a beautiful post about receiving the Eucharist on the tongue. Nostalgia, and How Time Really Does Fly—a Catholic mom shares photos and memories of her kids’ First Communions as her last prepares to receive. Fourth Time Lucky—several pre-Mass disasters help this family focus on what’s important during their daughter’s First Communion. Bracelets—a great way to help your child remember this special sacrament. Happy Saints eBooks—these adorable books include buttons, posters, cards, prayer cards, and colouring pages; your child can print, colour and display her favourite saints or do craft activities. Dolls & Figurines—Precious Moments has a large selection of beautiful dolls and figurines to commemorate your child’s special day. Saints and Heroes animated DVDs—get a DVD about your child’s favourite saint or Catholic hero from CCC of America. DIY Rosary—order a customized rosary for your child to make (everything is included in the kit). Holy Heroes Spiritual Diary Set—this diary includes quotes, prayers, guide to confession, space to write, and more. Holy Heroes also has lots of other great Catholic gifts for children. Blessed Immelda’s Eucharistic Miracle—share the story of Blessed Immelda, patron saint of First Communicants, with your children. What tips or advice would you share for a child’s First Communion? What gifts would you recommend? I appreciate that you included bracelets and DIY rosaries as good first communion gifts. I have a ring that reminds me of some of my religious convictions and it is a helpful reminder that is always with me! Thanks for the tips! I’ll try hard to find meaningful ways to buy reminders as first communion gifts in the future! It’s good to hear that your ring still means something to you! We do tend to be forgetful people who need physical reminders. 🙂 Thanks for sharing.